In a previous hub, we calculated slacks or floats. If an activity has a slack, its start can be delayed. For managing a project, there are various activities which have to be performed in some order. This was explained in Net-Working Techniques. There were some activities which were considered critical and hence cannot be postponed or delayed. While some other, non-critical activities, can be slipped or postponed within a slack-time. So far we have been discussing planning. The next phase would be implementing which is covered by Resource-Management. This is subject matter of this paper. 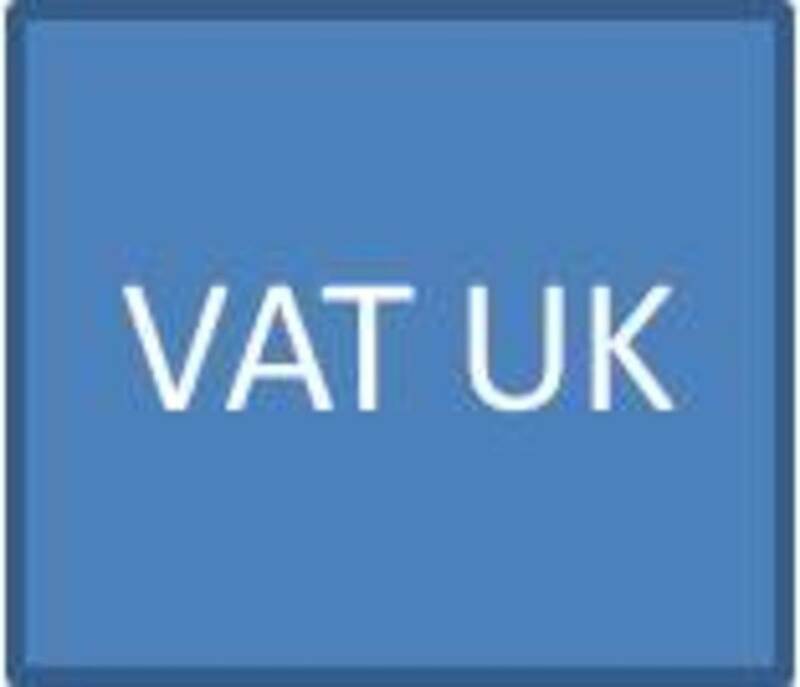 Resource is a generic word and is used in various ways. For our discussion, we would restrict it to 4Ms or Man, Machine, Material and Money. Once again, Management is a generic word. To simplify, it is a process of planning, implementing and controlling the resources to achieve desired objectives. Resource Management is using resources efficiently and effectively. While we talk of efficiency, we have some sort of input: output ratio in our mind. Supposing in yarn making, a 10% waste is normal. If we have 100 kg of cotton, we can produce 90 kg of yarn, 10 kg being the normal waste. If we can produce 91 kg of yarn from 100 kg of cotton, we would be considered efficient for having reduced the wastage to 9%. Also, we would be considered efficient, if we use only 99 kg of cotton for producing 90kg of yarn. To sum up, efficiency is having more output for the same input or less input for the same output. Then what is effectiveness? It is acceptability, usefulness or suitability from the users or market point of view. An overhead bridge may be constructed most economically and in record time. But it may not be effective, if few people make its use because they find an alternate route much convenient. In my class, I use multimedia which is much better or efficient than white board. But with frequent power interruptions, I find white board more effective. Let us take another example. A student gets high marks because of hard work. But when he goes to find a job, he is frustrated to find that what he had learned is not relevant to present job requirement. Remember Bill Gate. He was a drop-out butbecame very effective because whatever he learned he applied wisely. What are Resource Management Techniques? While making a budget, we estimated “Cost & Quantity” of each resource. If we want to add a room to our present setup in the university, we estimate how much money, men, materials and machines would be required. We would further estimate cost of furniture and gadgets for the room such as white-board, multimedia, clock, air-conditioners and tube- lights. “Resource Loading” is assigning resources to activities. It is the same as budget but broken down in terms of activities like (a) get approval of building extension, (b) lay foundations, (c) build super-structure, (d) put on a roof, (e) plaster the walls and (g) complete finishing. The money, men, materials and machines, as given in the budget, would be re-distributed in terms of activities. To sum up, “Resource Loading” is the process of assigning resources for each and every activity required for the project. It is evident that on third day, we would experience shortage of two workers while on the last day, two workers would be surplus. If we can make necessary adjustment, we would level or smooth out the excesses and shortages. What is Slipping and Splitting? In slipping, an activity is moved to another day. In other words, it is postponed or skipped. In splitting, an activity would be broken into small parts. If there is a seminar for three days, it can only be slipped to some other dates but would be carried out for three days in a row. If want to transport say twenty packages to a far-off place, we can transport them in any manners. While originally, these packages were to be transported on the same day, we can arrange their transportation in two or three or four lots depending upon the slack or cushion available. The following chart shows: (i) Resource Loading, (ii) Critical Activities and (iii) Slack available against non-critical activities. So far examples have been kept simple to make it easy to grasp the subject. In real life, there are not 5 to 6 activities but in hundreds. For the sake of convenience, a project is divided into sub-projects and even further into tasks. Even than, things do no get as simple as that. Try to solve the following question on your own and then consult the solution. I am sure it would NOT be a chicken feed this time. 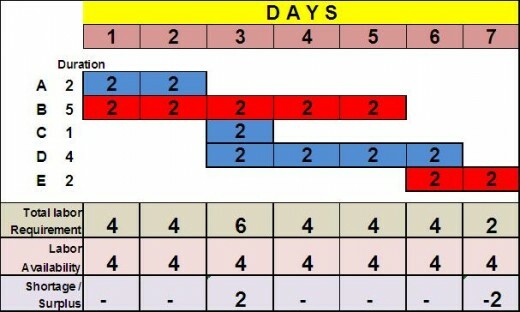 Both resource loading and leveling charts are given below: It would be observed that in one case the an activity had to be adjusted within its Total Float (Late Finish - Early Start - Duration). Please note there can many solution not just one. The aim is to compelete the project within the given time through a logical adjustment. The ability to manage a project is incredibly important. One thing that I would like to add is the project manager's ability to create cohesion in a group. Getting others to do things for you without financial incentive is an incredible skill to posses in the business world in general. Thank you, this work is comprehensive ! Thanks @MisterLB for your going through my articles. There are mistakes and there is problem in correcting them as these are in pictures. To charge something in picture, old one has to be deleted and fresh embedded which calls for lot of effort. I am at the moment concentrating on travel writing. Thank you hafeezrm for these interesting examples. I don't understand the solution of question 3. 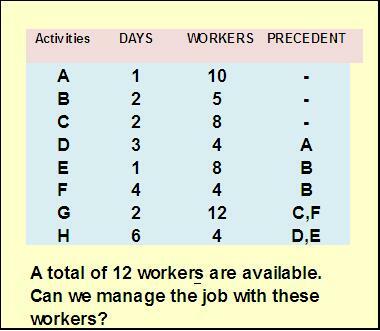 It is stated that activity G has F as a precedent. So G should always start when F is finished. In your solution, you use total slack to slip F, but G starts (day 7) before the end of F (day 8). Is it a mistake? I myself am victim of unknown charges. My income was frozen forcing me to withdraw my hubs one by one. No idea. I am myself victim of their self-made rules and one-sided decisions. I have removed all the advertisement and un-published many of my articles. I would shift the balance to other sites. I was new member at hubpages. I was banned from site for some violation. When I asked for clarification about rules I have violated no body answers. I wonder what went wrong on first or second day of joining I am Senior management Profile. I have never been insulted before. ?Going legal is not financially advisable. Can anyone suggest me something. It not that i want to to get back to site. But I just want my clarification answered . Can anyone suggest something? Thank you for this information because this solution certainly WORKS!!!! Almost same question. Labor comes under human resource management. Consult some good book or search for it on google. 1. What is the main differnce in principles between labor & equipment and material management ? 2. What is the main difference between the scheduler role when working with his own resources & when subcontracting every thing? (1) Labor is worker while material is raw material or construction material. (2) When one works with his or her own resource, he or she takes all responsibility of completing in time and within cost. On the other hand, in subcontracting risk is passed on to the contractor who is responsible for completing in time and cost even if the damages are to paid for late completion or extra cost. 1. What is the main differnce between labor & material resources ? 2. What is the main difference in principle between the scheduler role when working with his own resources & when subcontracting every thing? @Seema. As a rule, first consider the Normal slack as extending any activity within its normal slack or float would not affect any other activity. If it is not possible and you have to avail total float or slack, you have to consider if that particular activity goes beyond early start of the any linked activity. If so, the link activity should be moved accordingly. how do we come to know that now we have to extend to normal slack and total float? Thanks for visiting my hub. You are right that slack for activity C is 6, not 4. But this pertains to total slack not free slack. 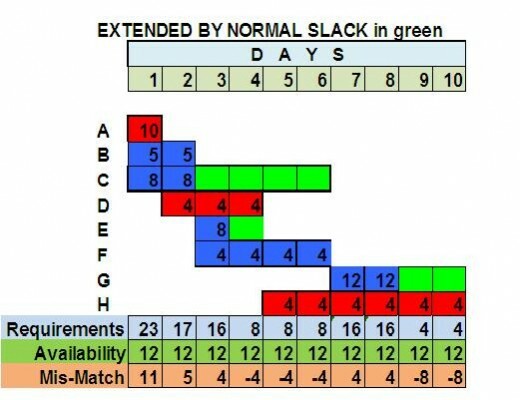 May I draw you attention to head of Gantt Chart which says- "extended by normal slack in green". At one place, normal slack does not meet the requirement and we have to resort to "Total Slack". 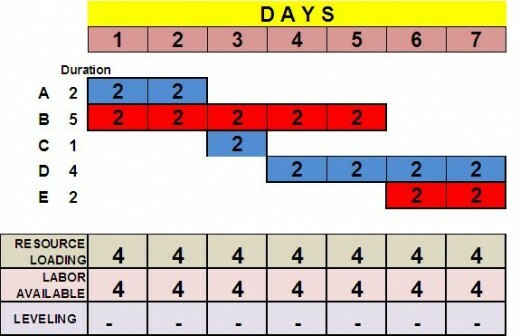 Again this is specifically pointed out in next version of Gantt Chart. As you know we should first use normal slack which does not affect any other activity. On the other hand, if we use Total Slack, we have to see if the linked activity has corresponding float or not. in the last question, slack for activity C is 6, not 4 as far as my knowledge and understanding of the topic. Thanks Espengongo for your observations and comments. Thank you for all your writtings. You are a very important source of information for us. May God keep you helthy for long time to continue promoting your science. I would like to submit a case for which I need your assistance to convince the executive board of a local company where one of my friends is working as sales manager. The company is planning to manufacture a new product and the Head of marketing has assigned to my friend to manage the project of engineering and manufacturing the new product. He was asked to develop a schedule and budget and present it to the executive management board within a week. After the meeting, one of the members of the executive management board (the head operations officer) give my friend the "go-ahead" for the project and ask to report directly to him and to personally approve each project step. In the same time, the head of operation will work on getting the approval from other executive members. My friend never led this kind of project over his 15 years of experience as salesperson, so it is difficult for him to achieve the goal and his risking to lose his job. -	Project manager not qualified to conduct the project. Thanks Zohaib Noor for your comments. You are right. The statements are pictures. It would take sometime to correct them. Thanks for pointing out. Thanks Shaheryar Abbas for your comments. the wording and numercial r so easy that one can understand it easily. Thanks Fahad for pointing out a mistake. You may take U activity as 15 days. 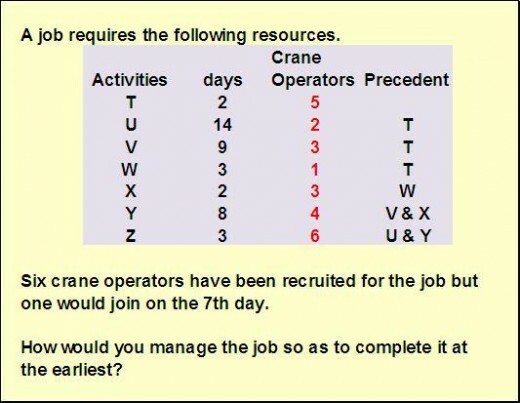 To check out whether it is 14 or 15, calculate total crane operators required for the entire project. It would be 126 which come with 15 days activity x 2 crane operator per days. All bar charts of loading and leveling support it. sir i have to ask the question of the above example in the 2nd question of splitting. 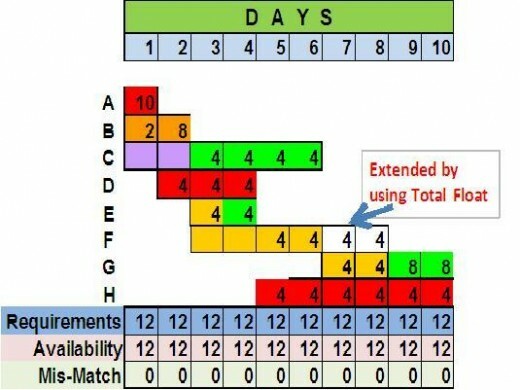 IF ACTIVITY "U" has 14 days then why in solution it end on 17th day?.I think it should end on 16th day. Thanks Christian for your comments. Great explanation and graphs on Resource Loading/Leveling. Sir, can you do me one more favor, if you get time, then please tell me that how we calculate Free float and Total float in Gantt Chart. really all the topics r excellent n helpful. Thanks Muhammad Shoaib Ikram for visiting my hub. 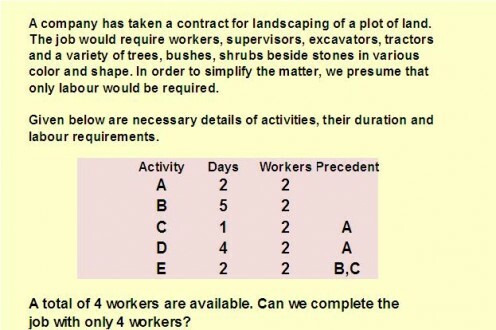 Yes, in first question, it is written (may be hidden under "see all 10 photos" that four workers are avaiable. But as you would observe, requirements would increase to 6 workers on the third day, creating a shortage. By moving some non-critical activity under its slack, the problem could be solved. Availability of workers should be given in the question. As against 12 workers, the actual requirement may jump to much beyond. If what ever we require is available, there is no problem, no conflict, no need for any levelling. It is only when we find a mis-match, we resort to slip or split to tide the temporary difficulties. Respected Sir, i would mention that this hub is very helpful to me because of grasping different concepts which i'm unable to grasp in the class. Needless to mention that the examples are once again really good and helped me a lot in understanding this hub. Thanks a lot Sir. sir this is very informative thanks for all notes you provide us. Thanks a million this will be very helpful as i do my course work and prepare for my finals in November.Thanks again. Truly nice article. Would recommend putting images of network diagram (for each example) showing dependencies of each activity and some concepts of Critical Path (forward / reverse pass). Nice to read article. The comments are also good to read. Good job. Thanks Shahzad Ahmed, Ravi and M. Shafiq Khan for your nice comments. It's very good sir, thanx for posting !!! It is the article which does not only present the basic concepts regarding resource management but also give the concepts, the real picture through examples. In short, it is an immaculate article. Now your HUBS are helping me revive those concepts effectively with simplicity. Thank you Usman for bringing back old memories. Thanks for liking the material. This was a very informative tool for my exam prearation in project managenet, it has cleared my thoughts on resource scheduling.A plus for this. Yes, This is very informative as we take these things with our class lectures. This will help us a lot. What confusion? Please be specific.